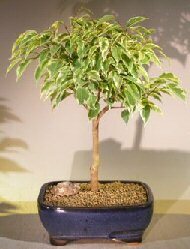 The Ficus Benjamina is an indoor tropical bonsai tree that is easy to care for. The Benjamina has evergreen leaves with a splash of yellow which is called "variegated". The leaf size can be reduced by trimming. Trimming will also keep the tree tight and compact as will direct sun. Humidity/drip tray is recommended. To purchase add $7.95.